If you’re looking for a fun and incredibly stylish leash for your dog- the LED lighted dog leash by Yippr Pet Supplies can be a great pick. These dog leashes are made of premium quality materials and they are specifically designed for protecting you and your furry friend while you’re walking down the streets in dark. One of the biggest reasons why you should get this leash is simply because it is visible from a distance of 1500 ft. This means, bicyclists, pedestrians and motorists will be able to see your dog and drive accordingly. It’ll also add a style statement and a fashionable appeal to your pet and they will enjoy wearing this leash all the more. What are The Features of This Leash? One of the primary reasons why you should get this leash is simply because of its cool and fun features. The features not only make the product more attractive, but they also make your dog stand an edge ahead of other pets. To begin with, these are USB rechargeable LED dog leashes, which means, you can charge them through any USB port. Whether it’s your laptop, PC, charger block of your smartphone or even Smart TV- the leashes are charged right away. It will hardly take you one to one and a half hours to get it completely charged. Right after that, you can use it for seven hours straight. This makes the product extremely convenient and viable for you. The leash is made of solid nylon webbing. This in turn will help you get a better grip while you walk with your dog. At the same time, the dual metal swivels in the leash will prevent all possibilities of twisting. The handle is made of soft pads, thereby turning out to be extremely user friendly. The stitching too is of excellent quality and the leash being 1 inch wide, will be comfortable enough for your dog. The leash is probably one of the coolest ways to make your dog stand an edge ahead. 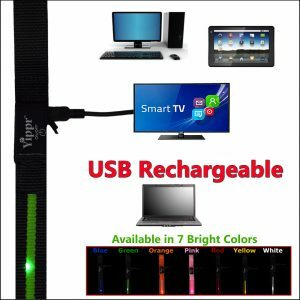 Just like the awesome lighted LED dog collars by Yippr the flashing leashes are available in five different colors including monochromes, red, pink, green and blue. You can always choose your favorite shade to deck up your dog in a fun and unconventional way. If you are looking for some innovative ways to make your furry pet stand out and look really cool, all way round- this leash is exactly what you need. Available in fun and innovative shades, it will add an extra oomph to your dog’s regular routine. Also, with the cool, blinking LED lights, your furry pet too is going to have some great fun wearing it. It’ll be comfortable for your dog and he will enjoy playing with it. The leashes are solid and resistant to all wear and tear. It can also withstand any weather condition. Using it for your dog is simple and he will totally love wearing it. So get one of these leashes for your dog today and let him walk in ultimate style. The LED dog leash is one of the coolest products you can get for your furry friend.